We are so accustomed to calling Singapore a “young” nation that we forget that this island has a longer and richer history than just the last 50 years. “From Another Time / 從新時光”, curated by ampulets, is an exploration of Singapore’s history, an attempt to look into our past in order to know better who we are as a democratic society today. Each illustrator was asked to respond to a specific period in Singapore’s history, to re-visit or re-imagine the people, places, events or objects that define that period. Through their work, you will catch a glimpse of Singapore’s past. And in the process, maybe you will look anew at Singapore’s present or be inspired to dream about our future. 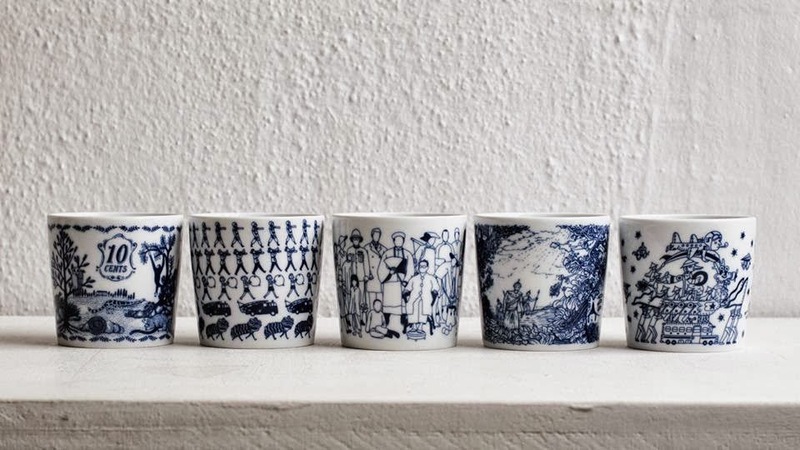 Together with Supermama’s product label Democratic Society, ampulets invited 5 talented illustrators in Singapore to create illustrations that are re-produced on a series of 5 cups by the 400 year-old ceramic maker KIHARA. The cups are available for sale at SuperMama at 8 Queen Street (Singapore Art Museum), S$36 each. You can also read about Ampulets' first collaboration with Supermama for Democratic Society here and here.